How do I delete a question bank in a course? You can delete Question Banks that you no longer use. Please note that deleting a question bank will affect any quizzes that are associated with the question bank, especially if they have student submissions. 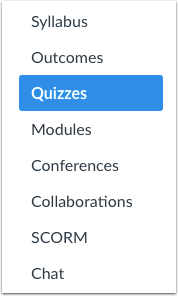 For students who haven't yet taken the quiz, they won't be able to see any questions from the quiz bank, but any existing quiz submissions will still show the previously included questions. 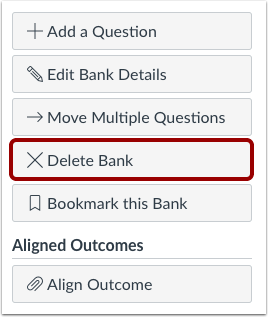 You can also delete a Question Bank by clicking the name of the Question Bank. Click the Delete Bank button. Previous Topic:How do I unbookmark a question bank in a course? Next Topic:How do I move multiple questions from one question bank to another? Table of Contents > Quizzes > How do I delete a question bank in a course? What are the ramifications of deleting a question bank?